Forever B12 Plus is an excellent combination of essential nutrients, that combines vitamin B12 with folic acid utilizing a time-release formula to help make possible metabolic processes, including cell division, DNA synthesis, red blood cell production, and proper nerve function. Helps maintain healthy homocysteine levels. Extremely safe, even in large amounts. Supplements of vitamin B12 and folic acid should be taken together. 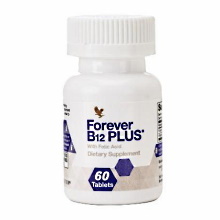 Forever B12 Plus is extrememly safe, as both components are tolerated in large amounts. It is also essential to a vegetarian or vegan diet, as vitamin B12 is normally obtained from animal sources. Vitamin B12 , or cyanocobalamin , was first discovered in 1948 as a nutritional factor that is vital for red blood cell production and it also works with folic acid to maintain healthy homocysteine levels in the body. Its deficiency also means deficiency in folic acid, which is critical to the fetus during the first three months of pregnancy, also making it beneficial to women wishing to conceive. Perform this first act of love for your baby and enjoy the benefits of vitamin B12 and folic acid together, in a formula exclusively designed to complement the rest of Forever Living's supplement range. As a dietary supplement, take one or two tablets Forever B12 Plus daily, preferably after meals.